Despite considerable investment in skills development, managers in public sector organisations still exhibit significant deficiencies in contract and relationship management skills and knowledge. This monograph is a practical, user-friendly guide to the benefits, perils and pitfalls of managing outside consultants. 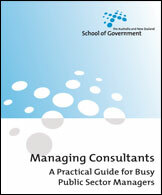 Writing from years of experience in managing consultants in government, Dr Dobes guides on best practice, as well as including advice on what not to do, and how to rectify shortcomings in the process of using consultants effectively.